Provide comfort for the family of Susan Wohler with a meaningful gesture of sympathy. Susan Jean Wohler, age 67, of Delton, passed away on March 24, 2019. Susan was born November 14, 1951, the daughter of Homer and Virginia (Vendeville) Britten. A homemaker, Susan enjoyed spending time with her family and friends, cooking-especially for big groups, and gardening. She was a supporter of the Muscular Dystrophy Association and a member of the Kalamazoo CB Club. Susan was also loved animals, especially her pets. In her free time, Susan enjoyed watching NASCAR, Matt Kenseth was her favorite, the Chicago Cubs, and playing Cribbage and Shuffleboard. Susan is survived by a son, Danny Britten; daughter, Kim Beauchamp; brother, Russ Britten; and several nieces and nephews. Susan was preceded in death by her parents, a son, Scott Savacool; significant other, Phil Jones; brother, Alon Britten; and sisters: Frances Lawrence, Beverly Ward, and Janet McConnell. Susan’s celebration of life will be conducted Saturday, March 30, 2019, 1:00 to 3:00 PM at the Williams-Gores Funeral Home. Memorial Contributions to Muscular Dystrophy Association will be appreciated. 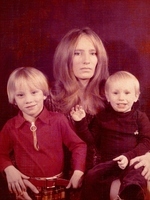 Please visit www.williamsgoresfuneral.com to share a memory or to leave a condolence message for Susan’s family. To send flowers in memory of Susan J. Wohler, please visit our Heartfelt Sympathies Store. Provide comfort for the family of Susan J. Wohler by sending flowers. I'll never forget my time with Sue, like when we took the motorhome and bar hopped most of the night.